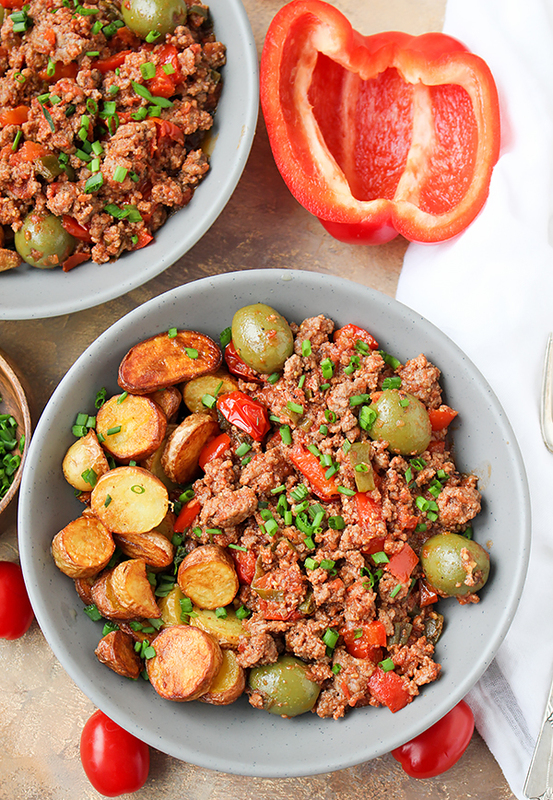 This Paleo Whole30 Cuban Picadillo is a quick meal that is full of flavor! Ready in under 30 minutes and so filling. Made gluten free, dairy free, and low fodmap. Quick disclaimer: I am not claiming this to be authentic, especially with my substitutions to make it low fodmap. It is based of Skinnytaste’s recipe. I AM claiming it to be an extremely tasty meal that you will make over and over! Quick, easy meals are definitely my go-to. My husband eats a lot and I don’t always feel like cooking. Surprisingly. 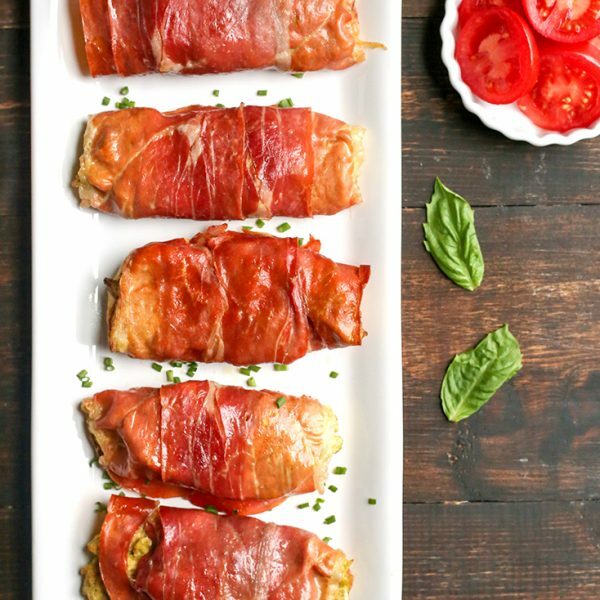 I have made this meal so many times and my husband absolutely loves it. The leftovers are just as good, if not better than when it’s first made. 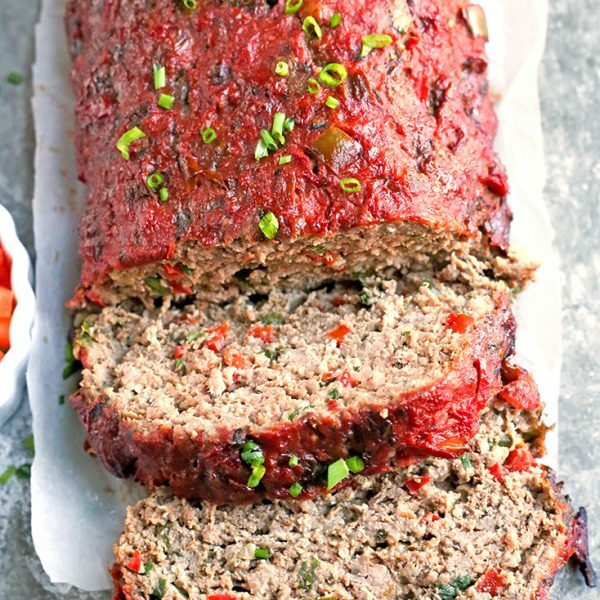 It would be perfect for meal prepping lunch for the week. Picadillo is usually served with rice and I have done that many times, but I thought pan fried tomatoes would be a nice change and I was right. The crunchiness adds great texture and I highly recommend trying it, especially if you’re doing a Whole30 and rice is off limits. 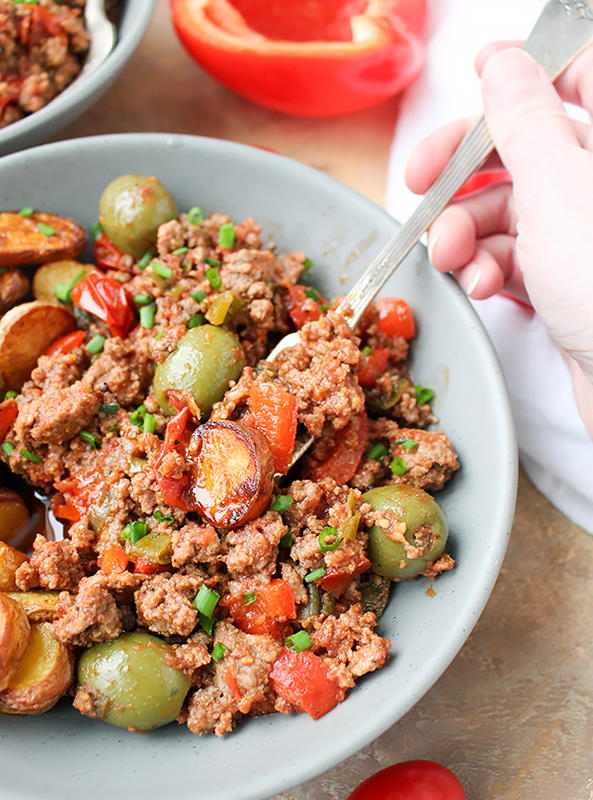 I made this low fodmap by using garlic oil, green onions, pureeing a can of diced tomatoes (since tomato sauce includes onion and garlic powder) and double checking the ingredients on the olives for no onion or garlic. It still has so much flavor though! 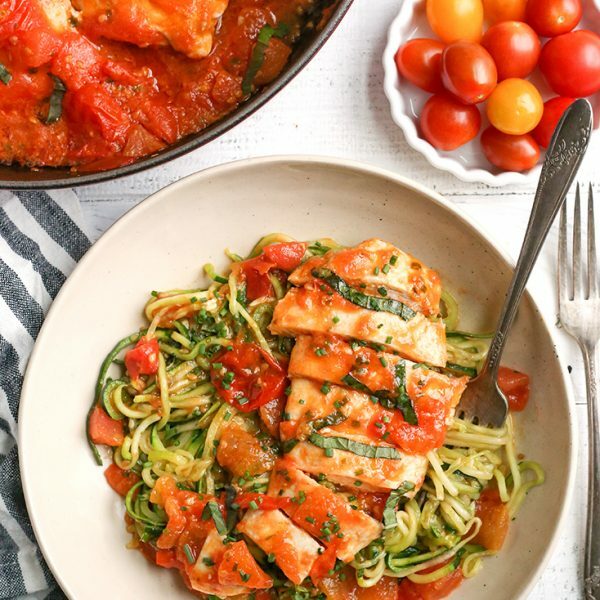 You will love this meal because it is easy, fast, and so delicious! 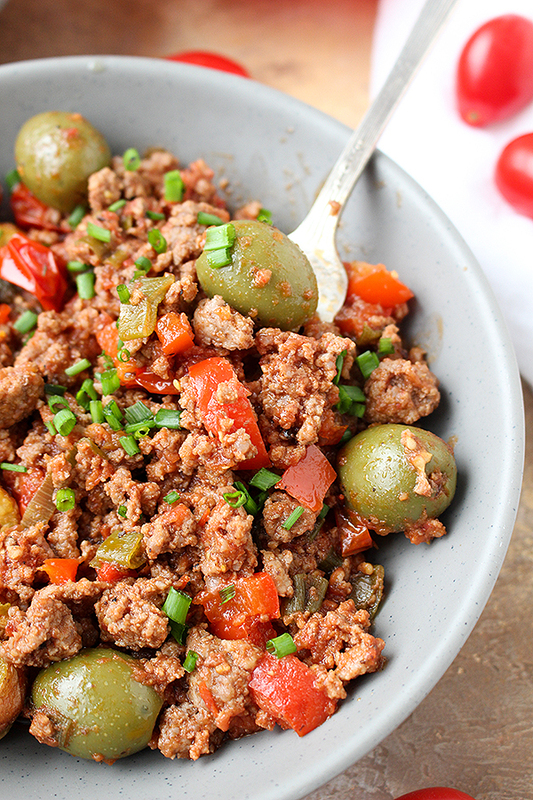 Even if you have never heard of Picadillo before, I encourage you to try it. I promise it will not disappoint! 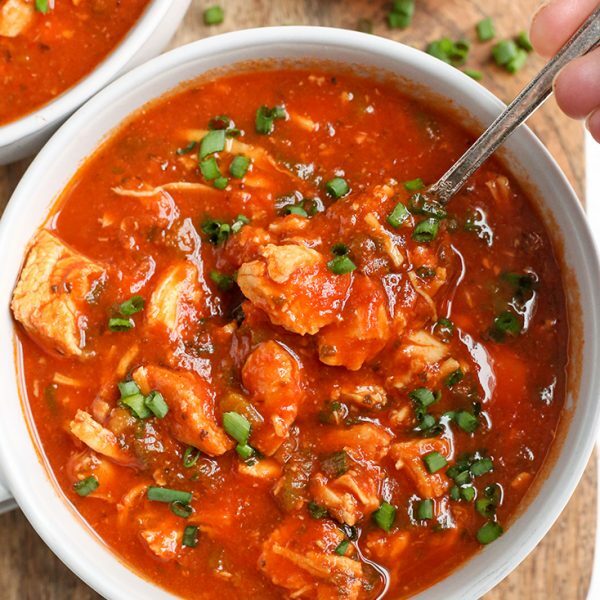 Here are some more Whole30 recipes that are quick: Easy Korean Beef Bowls, Sloppy Joes, and Stuffed Pepper Soup. In a large skillet, brown the beef in the garlic oil over medium heat. Sprinkle with salt and break up with a spatula as needed. Cook for 5 minutes. It may not be cooked through- that's okay. Add in the red pepper, tomatoes (both), green onion, and cumin. Cook until veggies are tender and beef in cooked through, about 10 minutes. Add in olives and brine and cook another 3-5 minutes. 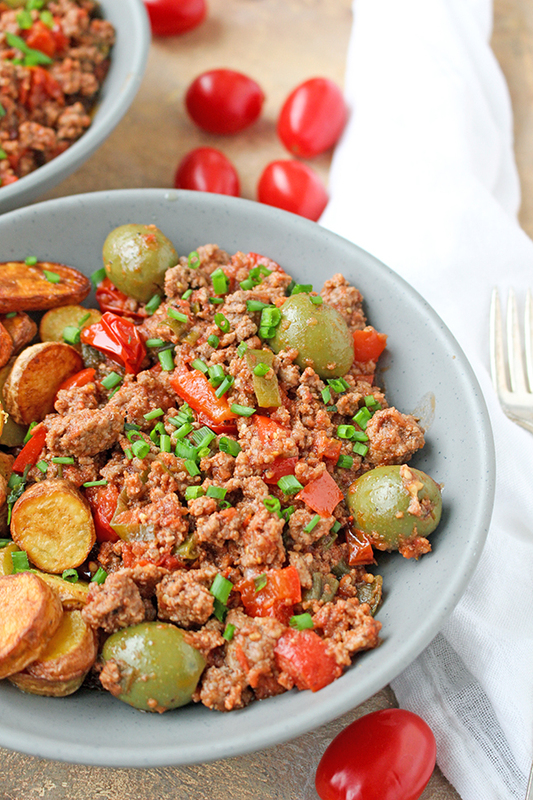 Serve with crispy potatoes or white rice if not on a Whole30. *I have added raisins before and it is a delicious touch. They add great sweetness to pair with the salty olives. They are not low fodmap though, so I couldn't add them here. I do highly recommend them though! I start my Whole30 journey tomorrow November 1, 2018. I found your blog and I feel so much better now that I have practical meals my husband and 3 little ones will enjoy. 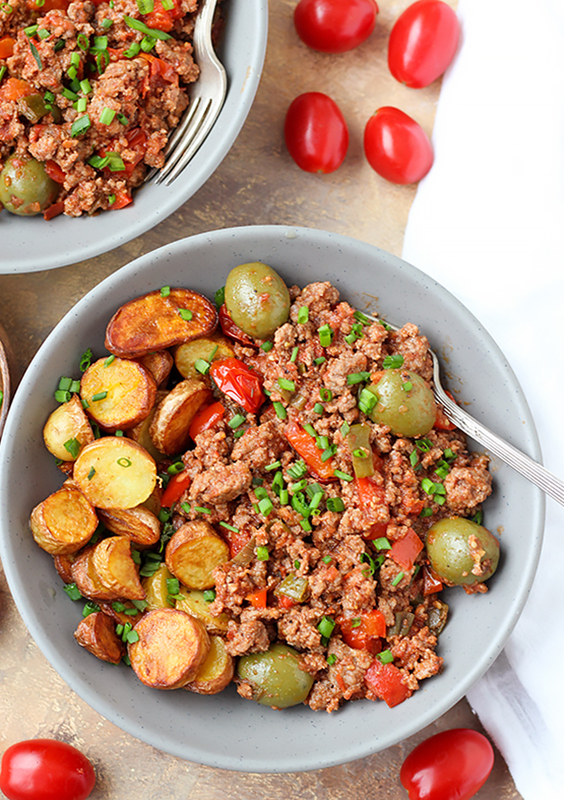 Regarding the Picadillo, are those potatoes that’s pictured?